We've been keeping track of the best deals to come from Amazon's Prime Day, but one of the most sizable discounts you can get today isn't actually tied to any specific gadget. Turns out, some AMEX cardholders can get 20% off, up to a maximum $100 off, if they link their AMEX Membership Rewards account to Amazon and make a purchase with at least 1 rewards point. There are a couple of conditions attached to this deal. For one, it'll only work on something shipped and sold by Amazon, so no third-party sales at the site will work. Additionally, not all cards work for the promotion. You'll need a card that can participate in Membership Rewards program enrollment that isn't already tied to automatic cash rewards. In some cases that means paying an extra fee. A full list of American Express cards which this promotion may work with is here. What you should see if your card and account are eligible. If your card is compatible, you can activate the offer for your account and link your card. At checkout, you'll then need to use your AMEX Membership Rewards for part of the checkout. The best part of this deal is that you don't need to use up all those points you've accrued. Redeeming just one point towards your purchase is enough to trigger the discount, giving you 20% off up to a $100. 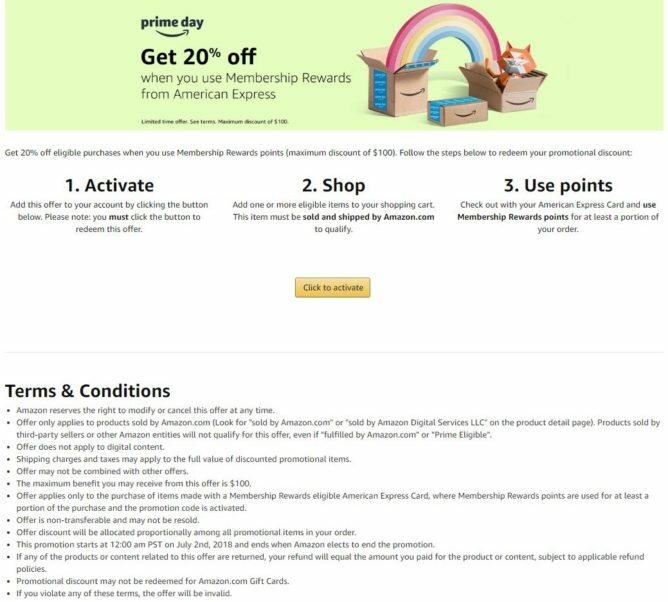 The deal could expire at any time, according to the terms attached to it, so you might want to take advantage of Amazon and AMEX's collective generosity sooner rather than later. You can even combine it with some of the deals we've been watching for maximum deal-savings. That could mean a $200 Essential Phone, $400 Huawei Mate 10 Pro, or a $650 Pixelbook.